When Norton Buffalo is the name in question, the answer is, quite a lot. While the name might not be immediately familiar to you, chances are good that you’ve heard Norton Buffalo many times, both on record and on the radio as a member of The Steve Miller Band. Buffalo was no ordinary sideman, and as Joel Selvin wrote recently, he had the gift of making anyone that he met feel like his friend. Last fall, after wrapping up a summer tour with Miller, Buffalo was diagnosed with cancer. Knowing that the prognosis was not good, Miller approached Norton about a benefit concert to be held after his passing, that would help with Buffalo’s bills. Norton gave Miller a wish list of bands and artists that he had played with through the years, that he wanted to be a part of the concert, and told Miller that he wanted to use the proceeds from the benefit show to pay off his medical bills and the remainder of his mortgage. The pair wrapped up plans for the benefit concert three days before Buffalo passed. Buffalo had the unique chance to organize his own goodbye party, which had grown into two nights filled with music from some of Norton’s closest musical contemporaries. After over 5,000 shows with Steve Miller, and the previously mentioned 180+ recorded album appearances, Norton Buffalo’s journey had come to an abbreviated close, gone much too soon at age 58, taken from this earth by the big “C.” Knowing too many people that are no longer with us because of cancer, it really warmed my heart to read Selvin’s story of the benefit concerts. At a time when Buffalo needed them the most, his friends were there for him without hesitation. Reading the list of talent that came out to remember their friend really made me respect those artists even more as a fan. 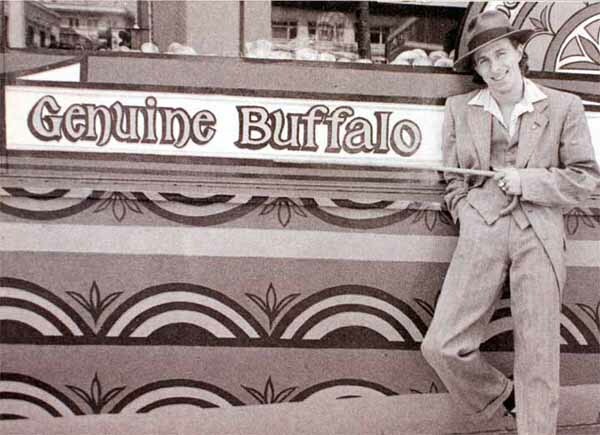 A list that included artists like Bonnie Raitt, Miller, The Doobie Brothers, George Thorogood, Charlie Musselwhite, Huey Lewis (although bad weather eventually kept Lewis grounded in Montana), and Elvin Bishop – wouldn’t you say that Buffalo made a bit of an impact while he was here? Today’s selection from the Vault is a nice performance from a particular sweet spot in the 40+ year history of the Steve Miller Band. Miller was on the road promoting Fly Like An Eagle, his latest album release, touring with a brand new band that included the debut of Norton Buffalo on the harp and vocals, in addition to the other players – Byron Allred on the keyboards, David Denny on guitar, Lonnie Turner on bass and vocals, and Gary Mallaber on the drums. Fresh from a stint touring with Commander Cody in Europe, it’s hard to pick out Buffalo as one of the new guys in the band, because he sounds so immediately at home as a member of Miller’s band. Miller and crew waste no time getting down to biz at the Beacon in New York City with a set opening version of “The Joker” that sidesteps the recorded version you’ve heard so many times for an island jam that provides an immediate spark of energy to inaugurate the set. Warmup tune? The Steve Miller Band don’t need no stinkin’ warmup tune. The 1976 release of Fly Like An Eagle marked the end of a three year recording hiatus for Miller, and with new material in hand, this Beacon performance finds The Steve Miller Band sounding remarkably fresh on both the old and new material featured in the set. Although he hadn’t released an album in three years, Steve Miller definitely had quite a bit of music to share with the world. While it’s not featured in this performance, Miller already had his next album Book of Dreams nearly in the can. Recorded during the same period as Fly Like An Eagle, Miller and band added a few finishing touches to the release, and Book of Dreams was eventually released a year after this Beacon performance. Norton Buffalo might be gone, but there is certainly plenty of musical homework to catch up on with all of the albums that he left behind. At the time of his passing, Buffalo was working on several music projects that his family is hoping to complete for eventual release including an acoustic “Norton and Friends” release, and also a CD of Hawaiian music. According to his website, there will also be a forthcoming Steve Miller Band release spotlighting a number of performances from Buffalo. The Beacon performance finds Buffalo shining brightly on his debut tour as a member of The Steve Miller Band. This particular show is one that you can download from the Vault, and I highly recommend that you should acquire this show for your own personal enjoyment. It works best when you download these files, burn them to CD, and play them at an appropriately loud volume while driving on the open road. Click here to download this show from The Vault.